CSG Snapshot: Walmart Stores Inc.
Less bricks more bytes. That’s the short of it for Walmart U.S. operations in the coming year. A record low 55 new US stores (20 Neighborhood Market stores and 35 supercenters) are on tap for 2017. With jet.com founder Marc Lore settling in as President and CEO of the company’s eCommerce business, a position he accepted in September tied to the jet.com acquisition, we can expect the bulk of Walmart’s expansion efforts to come in the digital space. 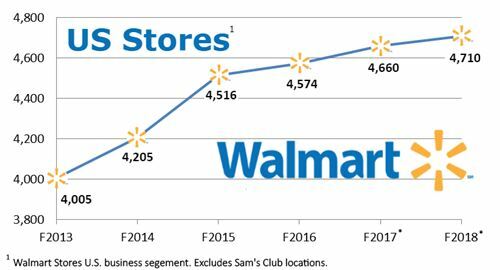 Case in point: In Q3, alone, Walmart Marketplace added 8 million new SKUs. 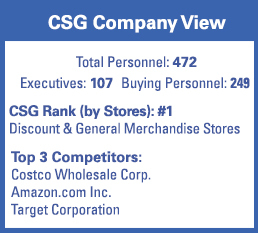 Source: Chain Store Guide Database of Discount Stores & Specialty Retailers. *CSG projections based on proprietary analysis and company statements. Actual figures are subject to change. This data is not intended for investment decisions. Walmart fiscal year 2017 end 1.31.17.